Gabe has been a life long friend of mine, and a constant source of creative inspiration. I knew I wanted a special piece of jewelry made by her because of the love and attention to detail she puts into every unique piece. The black and grey diamond earrings are truly one of a kind mementos that I will cherish forever. Every time I wear them I get to remember our friendship, and it makes me feel so special that they were designed for me to wear on my wedding day. 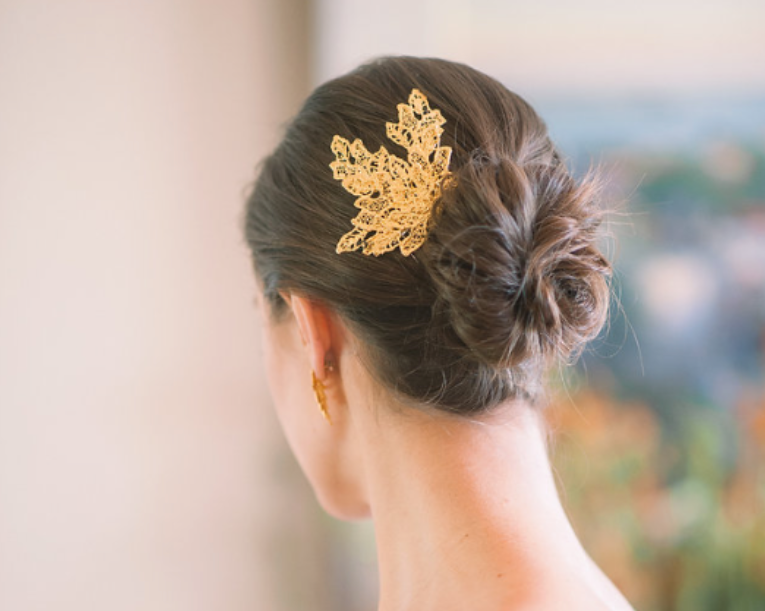 I had so much fun working with Gabe to design my custom wedding hairpiece and earrings. When picking my wedding jewelry, I knew I wanted something classic that would still make a statement. Gabe helped me choose from lace samples in her studio until we found the perfect shape and size to create my jewelry. She cast them in the perfect shade of gold to complement the other elements of the wedding. I still wear my earrings all the time and my mother and mother-in-law love the gold earrings that were given to them as part of the wedding celebration. The earrings I wore on my wedding day were made out of lace from my Mom's wedding gown. I had a vision of what I wanted to create, and Gabe took that vision and made it a perfect reality. The earrings turned out better than I could have ever imagined and allowed me to have a sentimental and unique piece of jewelry that I will enjoy for many years to come. I loved my hairpiece! It gave my simple yet elegant wedding dress the exact pop I was looking for. Honestly, it was my favorite part of my wedding day ensemble. It was sentimental and unique. Gabe's jewerly is one of a kind and I felt like it was my way of standing out in a sea of brides in veils. And I have been able to re-wear the hairpiece to two other black tie weddings. Highly versatile, stylish and makes a statement. I think I got more compliments on my hairpiece then my dress.